A new mapping project has identified regions worldwide that are most susceptible to dramatic permafrost thaw formations, known as thermokarst, and the resulting release of greenhouse gases. University of Alaska Fairbanks researchers David McGuire and Vladimir Romanovsky were part of the project, which was led by University of Alberta researcher David Olefeldt. They found that about 20 percent of the globe's northern permafrost region is potential thermokarst landscape. The research can be used in infrastructure and ecosystem planning and greenhouse gas modeling. The journal Nature Communications published the study this week. Northern permafrost soils store twice as much carbon as is currently in the atmosphere. When permafrost thaws, the organic matter in the previously frozen soil begins to decay, releasing greenhouse gases like carbon dioxide and methane. Those gases can contribute to climate warming and further permafrost thaw. "The most dramatic changes are likely to occur where permafrost thaw is accompanied by land surface collapse, known as thermokarst," Olefeldt said. Scientists can use the new map to test assumptions about how fast the soil organic matter will turn into greenhouse gases in these areas. Thermokarst occurs when thawing soil contains large amounts of ice. When that soil and ice thaws, the water drains away, leaving a void that can lead to more than two dozen distinct collapse landforms, including gullies, slumps, wetlands and lakes. Each type affects greenhouse gas emissions in its own way, and up until now no one has been able to account for all of them at the global scale. "There haven't been good estimates on how thermokarst disturbance could affect the release of carbon out of the soil," said McGuire, who is part of the Alaska Cooperative Fish and Wildlife Research Unit at the UAF Institute of Arctic Biology and U.S. Geological Survey. Scientists have been hindered by both the diversity of the thermokarst landforms and a lack of information on where these thermokarst landforms are most likely to occur in a warming world. 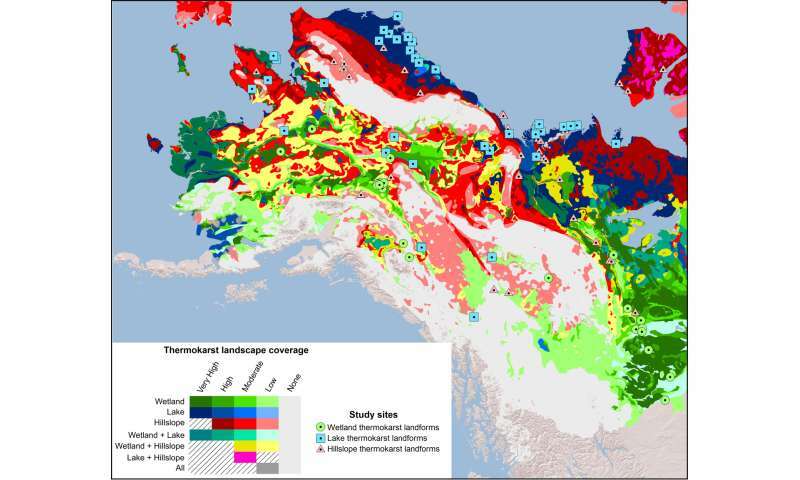 "This map is a first step to answer how the landscape will change with the thawing of permafrost in a warming climate. This is the big picture, it is useful as a general idea of what we should expect on a circumpolar scale," said Romanovsky, a researcher at the UAF Geophysical Institute. One of the most important results of the project was developing a method to prepare a map that will help scientists and resource managers estimate the effects of a warming climate on permafrost in these regions, Romanovsky said. "In Alaska we can see that some areas will be more vulnerable than others. For example, you can see from the map that the Yukon Delta and the North Slope regions will probably undergo significant landscape changes." Wow. The graph says it all. The Methane feed back was one of more scarier processes initiated by global warm. With 402 ppm of CO2, this was expected but we may have underestimated the extent of the methane release. That said, if you use google maps satellite view and start scanning the far east cost of Russia, you will see these interesting perfectly circular craters blown out of the permafrost. I would be willing to bet that each of the thousands of circles is caused by exploding methane release from the thawing permafrost. Look for Kristovaya for example. Good work phys.org. As usual a great job reporting science. The Methane feed back was one of more scarier processes initiated by global warm. With 402 ppm of CO2, this was expected but we may have underestimated the extent of the methane release. Look what his mancrush, False "Profit" Al, pooped out. No wonder he's still smelling methane. The FACT that NASA just squandered millions looking for methane emission in Alaska and found NONE does not matter to this brain dead Chicken Little.